Jean-Claude Paye is a Belgian sociologist and the author of several books, most recently L’Emprise de l’image (Éditions Yves Michel, 2012). Following the July 14, 2016, massacre in Nice, French President François Hollande once again extended for three months a state of emergency that was to have ended on July 26. 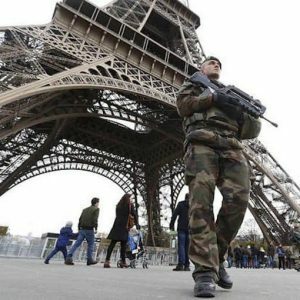 An initial, twelve-day state of emergency had been declared after the Paris attacks and extended for three months by a law of November 2015. Still another three-month extension was added and came to an end on May 26, only to be extended for two additional months. Despite the obvious ineffectiveness of such a measure, which did nothing to prevent the July 14 massacre, it has been extended yet again, through January 2017. In addition, in November 2016, the prime minister and president announced one after another that the state of emergency would be prolonged “at least” until the presidential election on May 7. This normalization of the “state of exception” has provoked only a muted public reaction. 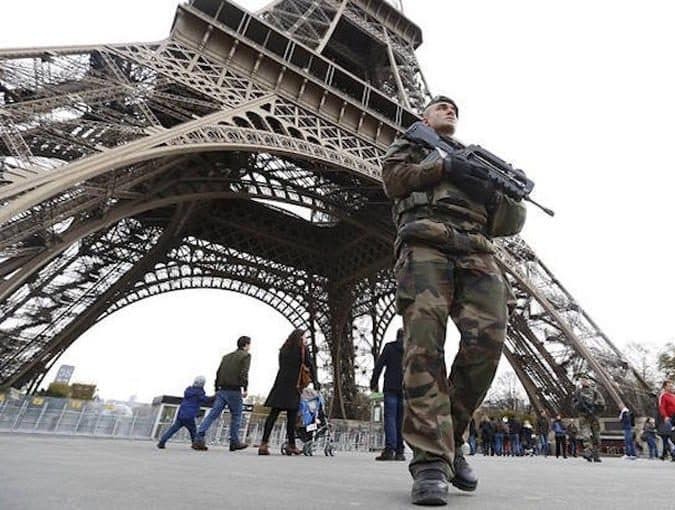 France has thus entered into a permanent state of emergency. This choice is not the result of exceptional events to which the country must respond, but rather expresses an intention to change the political system, as shown by the move to constitutionalize the state of emergency. Although the French government has provisionally given up its plan of introducing the state of emergency into the Constitution, following the lack of agreement between the National Assembly and the Senate on the question of deprivation of citizenship, the proposed legislation is important to analyze. This is not only because the matter was simply postponed, but above all because of the significance of the reform, i.e., a nation-state’s renouncement of its sovereignty. Article 36-1 on the state of emergency would have been inserted after Article 36, which specifies the conditions for a “state of siege” as a response to a serious crisis, war, or armed insurrection. The state of siege authorizes the transfer of police powers to the army as well as the creation of military courts. Article 16 of the Constitution allows the President of the Republic to claim “exceptional powers” when facing a “serious and immediate” threat to the “institutions of the Republic, the independence of the Nation, the integrity of its territory, or the execution of its international commitments.” This was implemented only once, during the “generals’ putsch” of the Algerian War. Full powers had then been granted to de Gaulle for five months. In contrast, the U.S. government, following the 9/11 attacks, expressed no intention of reforming its Constitution. It was left free of any procedure for exception or emergency. This does not mean that the United States has remained a more democratic country than France. Attacks against privacy, civil rights, and, above all, habeas corpus have proven even more virulent in the United States than in Europe. The act of preserving the Constitution, then, is not the result of any concern by the U.S. government to retain the democratic order, but an assertion of its own privileged place in organizing the global “fight against terrorism,” as commander and decision-maker. Moreover, Great Britain, which likes to think of itself as an ally of the United States and not its dominated partner, has chosen to treat the question of a state of emergency at the level of the law and leave its (unwritten) Constitution unchanged. In Germany, there is no legislation establishing a specific system analogous to the state of emergency as it exists in French law. It is Germany around which the European Union was constructed: it organizes the EU’s economic and monetary policy, and has strongly influenced international police cooperation, including the creation of Europol. The U.S. Constitution makes no mention of “exceptional circumstances.” Since 9/11, the threat of terrorism has been considered equivalent to a “state of war,” so that exceptional powers could be transferred to the President of the United States, thus allowing for a set of measures exceptional in relation to common law. Congress adopted a resolution on September 14, 2001, stipulating: “the President is authorized to use all necessary and appropriate force against those nations, organizations, or persons he determines planned, authorized, committed, or aided the terrorist attacks that occurred on September 11, 2001.”6 The broad interpretation of the law by the executive branch has provided it with unlimited authority in both space and time to act not only against those responsible for 9/11, but any potential aggressor or designated enemy. The authorization itself includes a preamble: “the President has authority under the Constitution to take action to deter and prevent acts of international terrorism against the United States.” George W. Bush routinely cited this line to justify violations of the constitutional freedoms of U.S. citizens. President Obama used the same interpretation during the promulgation of the National Defense Authorization Act (NDAA), which he signed in December 2011.7 Obama did not consider the new law an expansion of presidential power, since the possibility of suppressing habeas corpus and other civil rights was, in his estimation, already contained in the authorization granted by Congress in 2001 to use force against the perpetrators of the 9/11 attacks. Both the Bush and Obama administrations have treated this law as equivalent to a declaration of war, like those passed during the Second World War. The field of application, however, has become much wider. The interpretation made by the two administrations eliminates any distinction between internal and external, thereby allowing for the use of force not only against other nations, but also against organizations or individuals, including U.S. citizens. This is not the case for France. The insertion of the state of emergency into the Constitution gives a legal, textual basis to a reorganization of state power. The change in relations between citizens and the government is inscribed in the reversal of the very function of the Constitution itself: its purpose is no longer to guarantee rights and establish limits to the exercise of power, but, on the contrary, to decree punitive measures, that is, to curtail civil freedoms and abolish the guarantees for those freedoms in the face of the arbitrary exercise of state power. The rules for amending the U.S. Constitution are quite restrictive. The Constitution remains intact, but is reduced to an image of sovereignty for domestic and external use. Also, unlike in European countries, the U.S. legislative branch remains formally valorized. It is really a matter of showing subaltern states that the United States alone remains a state in the full sense of that term, retaining an intact state structure as guarantor of fundamental sovereign power. An example will allow us to see the difference between the place granted to the legislative branch in the United States and in EU member countries. The extradition agreements signed in 2003 between the European Union and the United States were negotiated independently by the European Police Office, in accordance with the expectations of the 1995 Europol Convention, without a recommendation from the European Parliament, verification by the European Court of Justice, or ratification by any national parliament.8 European citizens finally found out about the project because part of the document had to be declassified in order for the U.S. Congress to ratify it. This episode shows quite clearly the uniqueness of the United States in comparison to the European Union, whose members have ceded a large portion of their power to international institutions (not only the European Union, but also NATO). The unique situation of the United States results from the fact that its institutions are not formally subjected to the reforms imposed on other nations, such as the elimination of judicial power and the weakening of the legislative branch. Command over the imperial order presupposes that the U.S. state itself appears external to that order. As noted above, President Hollande’s proposal to include the state of emergency in the Constitution is not a response to any concern for legal consistency, as the French government claimed. Precedents from France’s Council of State, its Constitutional Council, and from the European Court of Human Rights have completely validated the state of emergency measures provided for in the 1955 law. In fact, Hollande’s proposal eliminates any legal security. It not only constitutionalizes the state of emergency, but above all permits, within this context, a relentless attack on civil freedoms, setting in stone not only the principle of a state of emergency and its already well-known applications, but also allowing for the possibility of lawmakers continually establishing new measures. Thus, the new articles would allow for a “renewing” of the “tools” that the “security forces” will be able to use, in violation of rights and freedoms. The rule of law would be dismantled, since the rules would no longer be fixed and predetermined, but would continually change according to the government’s subjective interpretation of changing events, all justified by the persistent threat of “terrorism,” and its choice of measures to meet this threat would be freed from any control. The proposed constitutionalization of the state of emergency allows for the constant development of different measures and confirms the present tendency to make criminal law a constituent act. In fact, the inclusion of the state of emergency in the Constitution formalizes the constituent function of criminal law: it establishes a new relationship between citizens and the administration, and grounds the unlimited power of the latter. On March 30, 2016, Hollande announced the withdrawal of the proposed legislation.9 The news came as a surprise, since the constitutionalization of the state of emergency had been accepted by a large majority of deputies in the National Assembly, both pro-government and opposition. The abandonment of the reform is solely motivated by an absence of agreement on the revocation of citizenship. The focus of the government on this question might seem odd, since the revocation of citizenship already exists in the French legal system, and the procedure has been applied many times. Between 1949 and 1967, around 523 persons were deprived of French citizenship, including “numerous people who were French by birth.”10 That fact invalidates the justifications, advanced by both the government and the Council of State, that including the revocation of citizenship in the Constitution would avoid the risk of unconstitutionality that an ordinary law might entail. Yet the Constitutional Council has never challenged existing laws that have led to the same result. The real reason the debate on the proposed legislation focused on revocation of citizenship was its disturbing resemblance to laws of the Vichy government. The Vichy laws affected more than 15,000 people. The reference to those laws is all the more pertinent since the deprivation of citizenship currently under consideration could also take on a mass character in light of the anticipated extension of its conditions of application in successive drafts of the proposed legislation. In the latest draft, deprivation could occur not only for crimes of terrorism, but also for minor crimes: thus a French citizen convicted of “apologizing for terrorism” could be deprived of citizenship. According to Le Monde, the Minister of Justice counted 255 cases of apologizing for terrorism in the month after the November 2015 attacks. The figures for January 2016 are similar. Yet these apologies are nothing of the sort. In several cases, there is a very thin line between this supposed apology and police provocation. These cases were sent to court immediately. As defined in existing law, apology consists of justifying terrorism, presenting it in a favorable light, or encouraging terrorism.11 However, under the new law, journalists or citizens could be prosecuted, for example, for having shared an online video by an organization designated as terrorist, or having given members of politically demonized organizations the opportunity to speak. Such an accusation could lead to the conviction of opponents of France’s foreign policy in Syria, Libya, or Palestine, which, in addition, could result in deprivation of citizenship. The situation would then be very much like that of Vichy France and the 1940 law that permitted deprivation of citizenship for French citizens committed to General de Gaulle. President Hollande provisionally gave up the constitutionalization of the state of emergency, a major reform already envisaged by the Balladur Committee in 2007, following disagreement over the methods of deprivation of citizenship. At first sight, linking the two things so closely might be surprising. However, constitutionalization of the state of emergency and inclusion of deprivation of citizenship in the Constitution refer to two inseparable aspects of sovereignty: its effective reality, the exclusivity of the political decision, on the one hand, and its symbolic existence, the “people’s sovereignty,” on the other. The possibility of depriving a French citizen convicted of terrorism of his or her citizenship is a reversal of the symbolic character of sovereignty; it gives the government the prerogative to institute “the people,” and thus become part of an international order that leaves no place for the recognition of the population. This international order is a global structure in which the French government occupies a subordinate position and has no possibility of any meaningful participation in its functioning or in the formulation of its rules. To surrender full control over political decision-making within the context of the anti-terrorist fight, ceding it to an international order organized by the dominant power, requires that the symbolic aspect of national power, its institution by the people, also be called into question. The imperial structure is a de facto order that frees itself from any mechanism of popular recognition. To constitutionalize the state of emergency, to incorporate into the Constitution what François Hollande calls “civilian rule in crisis mode,” is to sanction renunciation of sovereignty. In fact, the sovereign is the one who decides on the exception. According to Carl Schmitt, “the exception reveals most clearly the essence of the state’s authority. The decision parts here from the legal norm.”12 If exceptional powers are incorporated into the Constitution, they evade the political control properly speaking, because they become an integral part of the norm, and the distinction between “normal” and “exceptional” disappears. For the U.S. executive, by contrast, it is a question of re-establishing the primacy of its decision-making in relation to the norm, and of affirming that it is not strictly accountable to laws issued by the legislative branch. On signing the NDAA in 2011, President Obama stated that, although the law gave him the authority to do so, his administration would not authorize unlimited military detention, without trial, of U.S. citizens.13 The possibility of doing so would not itself be contrary to the U.S. legal order, but only to “American values.” Here, primacy no longer resides in the legislative text, but in the presidential initiative. Obama also asserted that there was no legal obligation to detain foreign terrorists militarily. He affirmed that his administration would “interpret and implement the provisions described…in a manner that best preserves the flexibility on which our safety depends and upholds the values on which this country was founded.” He thus resolutely discards the rule that once a president has signed a law, he or she will faithfully apply it. Contradicting his pre-election statements, Obama has joined a tradition, developed by Ronald Reagan, George H. W. Bush, Bill Clinton, and, above all, George W. Bush, of using “signing statements” to undo the restrictive character of a legislative text, to the advantage of presidential power. For Obama, this law must not restrict his freedom of action. He is opposed to military detention, which would limit the “flexibility” of the administration’s actions—for example, the possibility of detaining a foreign prisoner in an offshore CIA camp. The reversal between the 1955 law and the current concept of the state of emergency is a move from the denegation (denial) of the political character of acts of resistance to a denial that suppresses any contradiction by making two opposed things, criminal actions and acts of war, analogous. It thus effects a constant confusion between the two, as perfectly illustrated by François Hollande’s expression “terrorism of war.” The proposed solution illustrates this as well: “civilian rule in crisis mode” in order to deal with a new form of war. Thus there is no distinction made between crime and war, between inside and outside the nation. As for the Algerian war, the denegation mentioned above had to give way to a political recognition of the Algerian resistance. It proved to be an act of political repression that was only temporary. The procedure, then, still fell within the original meaning of state of emergency, i.e., an exceptional situation limited in time. The concept of the state of emergency as found in the law of November 20, 2015, and in the proposed constitutionalization is quite different. The merger of crime and act of war is not a product of contingent circumstances that would then give way to a renewed distinction between the two and a return to politics. The negation of a fact that is recognized, but not accepted, such as the existence of the Algerian resistance, is replaced by the denial, the non-recognition, of reality. Any attempt to understand and analyze is dismissed; the concept of the “permanent state of emergency” places us outside of language. A psychotic process emerges, a continuous process of refusing to distinguish between criminal procedure and managing a war situation, between criminal and enemy, between war and peace, and between what is internal and external to the nation. The nation itself now finds its ground in an international form of organizing power. By including the state of emergency into the Constitution, the nature of the latter is reversed. The Constitution is no longer the site for the formal recognition of rights; rather, it becomes the site for their limitation. As such, it formally recognizes the omnipotence of the government, particularly that of its police services. Moreover, the Council of State was not mistaken in its opinion on the government’s proposal to constitutionalize the state of emergency. For the Council, the draft law “is not a mere clarification” of the 1955 law; it “effectively” provides “an unquestionable foundation” to police measures by “submitting them exclusively to control of an administrative court” and not to an ordinary court.14 The constitutionalization of the state of emergency would make it possible to legitimize police work and give it complete freedom of action since it would be submitted only to an administrative court that has neither the means nor the authority to carry out such oversight. In this way, the Constitution would record and also legitimize the results of all the reforms of the judicial system: the elimination of the examining magistrate, the solely formal power of the prosecutor, and the real power of the police. The constitutionalization of the state of emergency is the final piece in a process, specifically, the formal inscription in the Constitution of the elimination of the rule of law. It is the police system that then becomes the core of the national state. Yet it is crucial to note that this form of state does not retain any real independence even at this level. Of course, the prerogative of maintaining order remains within its purview, contrary to war, money, or economic policy. However, the FBI directly organizes European police forces themselves. This “collaboration” dates from the beginning of the 1980s and even at that time had the “fight against terrorism” as its immediate pretext. Not only does the FBI organize the mixed intervention teams, but due to this “collaboration,” it has also succeeded in strongly influencing European legislation both at the national and EU levels. The areas involved concern interception of communications, control of the Internet, creation of new crimes of terrorism, and reforms of police and legal systems.15 The police forces of the European states and their secret services, such as Europol, the EU police, are first and above all parts of the imperial structure, before being forces controlled by the executive branch of national states. ↩ “Projet de loi constitutionnelle de protection de la Nation,” Légifrance, March 23, 2016, http://legifrance.gouv.fr. ↩ “Etat d’urgence et article 16: pourquoi Hollande veut-il réviser la Constitution?” Le Monde , November 16, 2015, http://lemonde.fr. ↩ “Etat d’urgence: ce que prévoit le projet de réforme constitutionnelle de Hollande,” FranceTV, December 3, 2015, http://francetvinfo.fr. ↩ Michael J. Williams, NATO, Security, and Risk Management: From Kosovo to Kandahar (London: Routledge, 2009). ↩ V. Ganev, “Emergency Powers and the New East European Constitutions,” American Journal of Comparative Law , no. 45 (1997): 585–615. ↩ Authorization for Use of Military Force, September 18, 2001, Public Law 107-40, http://gpo.gov. ↩H.R. 1540, National Defense Authorization Act (NDAA) for Fiscal Year 2012, http://gpo.gov. ↩ “Draft Agreement on Extradition between the United States of America and the European Union,” Council of the European Union , 8295/1/03, Rev. 1, June 2, 2003. ↩ “François Hollande renonce à la déchéance de nationalité et au Congrès,” Le Monde , March 30, 2016. ↩ Aude Loriaux, “Déchéance de nationalité: Pour y voir plus clair, les arguments pour et contre,” Slate.fr, February 6, 2016, http://www.slate.fr. ↩ Article L. 421-2-5 of the law of November 14, 2014, which reinforces the provisions related to the fight against terrorism. ↩ Carl Schmitt, Political Theology (Chicago: University of Chicago Press, 1985), 13. ↩ H.R. 1540, National Defense Authorization Act. ↩ Conseil d’Etat, “Loi constitutionnelle de protection de la Nation,” Avis consultatif, December 23, 2015, http://www.conseil-etat.fr.